Our List of Happy Customers! "We are big fans of WebShopApps. We are powerhouse developers of Magento sites so we know a good app when we see one. Your entire suite of shipping extensions has proven to be extremely successful for many of our clients. The flexibility is extraordinary so we can adapt to each store’s particular needs. Moreover, your customer service is impeccable. From a web developers viewpoint, WebShopApps is a dream come true!" "We've loved working with Webshopapps/Karen. She's very responsive, friendly, and knowledgeable of the Magento platform. We've used her modules on many of our Magento sites. If she doesn't have a module that fits our needs, she's always very quick to suggest alternative options." "The WebShopApps team consistently delivers not only some of the most reliable extensions out there - they also define the standards for how to provide an amazing level of support. When it comes to any custom shipping requirements - it is a no-brainer to turn to WebShopApps as the go-to solution for anything shipping related. Hands down - the best Magento extension development firm out there." "We've purchased a couple of these shipping apps, one for a client who wanted to set shipping on an individual product basis and one for another client who sold some products that were hazardous and could not ship by air. There was also a premium involved in shipping hazardous materials ground. "The apps were more than capable of handling our requirements and the one on one support was excellent. Magento's shipping is pretty basic and these apps extend the functionality allowing us to customize our clients stores and deliver a better product. "What makes WebShopApps stand out from the crowd of Magento module developers? Their modules are tested thoroughly prior to release, installation and configuration documentation is clear and detailed, and after-sales support is prompt and helpful. "I first encountered Karen in the Magento forum when she was helping newbies to get to grips with Magento. I needed a table-based shipping module and she had one available so I gave it a go. The module worked well and has since been upgraded with added functionality. "Since then I have needed to make certain things happen in Magento and couldn't find any existing modules that worked, so I asked Karen to help. She was able to produce several bespoke modules for me to allow me to add functionality like complex tax calculations, shipping insurance, product feed creation, professional PDF invoices / packing slips, printable address labels and delivery tracking. "I have been very pleased with the work Karen has done for me over the last year. Many Magento extension developers seem to lose interest in their extensions after they have released them, but Karen has somehow managed to continue to support all the extensions she has released and even on occasions been able to help me with extensions released by other developers when those developers had long since lost interest. "WebShopApps modules come with my highest recommendation!" "When I setup Magento for the first time I thought I wouldn't need any additional extensions. As time went on I realized I needed more advanced options for shipping that did not come standard with Magento. My Tulsa Web Design company LaunchTulsa.com utilizes Web Shop Apps extensions to add additional advanced options for shipping, free shipping and discounting features. "Web Shop Apps also works very well with Magento, we have upgraded Magento multiple times and the extensions work without errors or bugs. The team at Web Shop Apps has also been very friendly and helpful with any questions I have. "I recommend Web Shop Apps extensions as a must have for anyone that uses Magento." "Wir verwenden Product Matrix in einem Onlineshop eines großen deutschen Museums. Unsere Fragestellung: Eintrittskarten sollten einen pauschal Versandpreis haben - egal wieviel Stück der Kunde kauft, die Bücher und Merchandiseartikel sollten nach verschiedenen Gewichtsstufen kalkuliert werden. Mit Product Matrix kein Problem und schnell umgesetzt. Bei Fragen hatten wir sofort eine Antwort von Karen im Postfach - nicht nur mit irgendwelchen allgemeinen Hinweisen, sondern mit der Lösung UND und der korrigierten Tabelle!! Hut ab, toller Support, danke Karen auch im Namen unseres Kunden!" "In the sea of poorly or unsupported Magento extensions, Karen's Webshopapps are like a lighthouse! 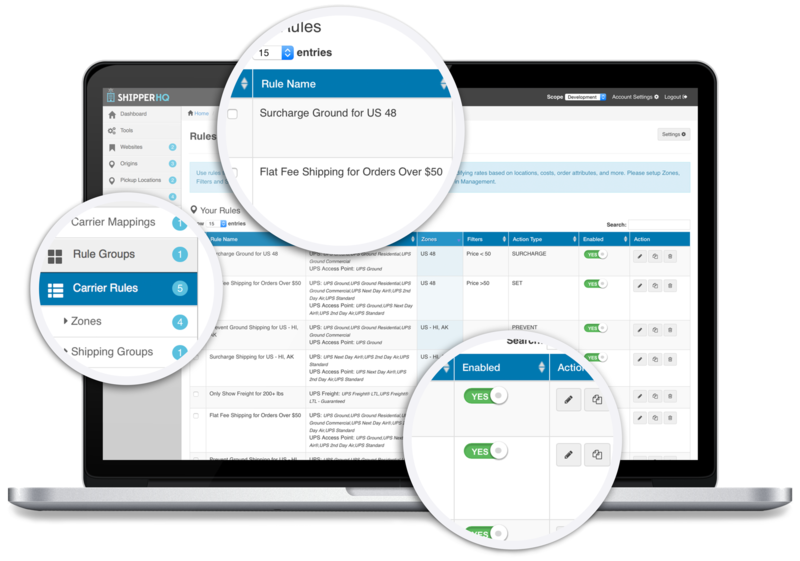 "I spent days wrestling with a basic shipping issue before discovering the solution was so easy with Matrixrates. But not only does Karen produce shipping modules that really work in the real world, she provides support above and beyond what could normally be expected. I don't think I could use Magento without Webshopapps shipping modules, and knowing the support is there when something goes pear-shaped is fantastic." "We've been very impressed with the premium matrix rates extension that we purchased, but admittedly more so by the fantastic support that WebShopApps have provided us. It's a powerful extension that makes complex shipping rules possible, so takes a bit to get your head around but we were absolutely able to implement ourselves without any development knowledge by tapping into their excellent support."